Picking four colors from an inspiration piece. When decorating a room, using four colors is an ideal. There should be one Predominant color: color that you see first, and is used most in the room. One Subordinate color: second most used color in a room. AND one, but no more than two Accent colors. Accent colors are used sparingly as they work around a space. Picking four colors to decorate a room with, is an easy thing. The colors can come from patterned fabric on a sofa or chair. They can come from colors used on an oriental or patterned rug. The colors could even come from a painting, or other kind of art object (fancy vase) that will be used in that room. 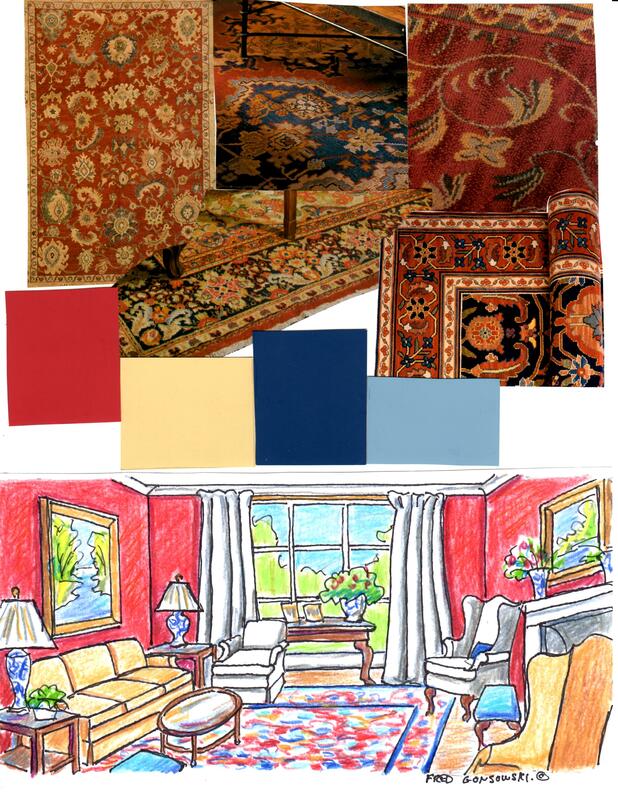 Now let’s pull the colors from the collage of oriental rugs, that are at the top of the first illustration. The rugs all have different patterns, but all share the same colors; (burgundy, gold, navy, and colonial blue). Looking at these rugs, if Burgundy is the most used color, and the first color that you see, than that is the Predominate color. If Gold is the second most seen color on the rugs, than Gold is your Subordinate color. If Navy is the third most used color, that is your First Accent color. If Colonial Blue is the fourth most used color, Colonial Blue is your Second Accent color. If you don’t like the second accent color, and there are other colors to choose from, pick one of them as your second accent color. See how EASY that was! One more color to think about WHITE. White is a free color. You don’t ever count it as one of the four colors, even if it is part of “an inspiration piece” that you are using to pull your four colors from. When applying the flow to interior decorating, you are taking your four colors, and each of the colors has its turn, in rotation, depending on what room it is in, being a Predominate, Subordinate, or Accent. Burgundy might be the predominate in the living room, but will be an accent in the kitchen. What you want, are remnants of each of the colors, being in all the rooms, to tie them together. Now look again at the illustrations. At the top is the collage (inspiration piece) where we pulled the four colors from. The first room below that is the Living Room. The walls are burgundy red, the predominate color (or the best I can do with colored pencils), the sofa and wing chair are gold, the subordinate color, and the Chinese blue and white lamps, vases on the fireplace, and pillow on the white wing chair are the First Accent color navy. The colonial blue, Second Accent is on the bench by the fireplace, and chair by the sofa. If this was a real room, I would also put two Colonial Blue and Gold striped pillows on the sofa, and a colonial blue throw on the gold wing chair. Color must ALWAYS be worked around a room, NEVER isolated! The Hallway is predominately gold, followed by navy, colonial blue, and burgundy. In the Dining Room, the predominate color is the wood tone of the table, chairs, and sideboard. Subordinate is navy blue (drapes, Chinese blue and white dishes and rug). The First Accent is the colonial blue striped walls, the Second Accent is burgundy on the chair cushions and carpet. Finally, the Kitchen… predominate color is Colonial blue, with burgundy as Subordinate, and the accent color is gold (wood tone of table.) WOOD is a COLOR TOO! Now you might say “I like White walls and White Drapes”. That is FINE! Use the four colors, taken from the inspiration piece for upholstery fabric, rugs, art works, painted furniture, and decorative accessories. ALSO, The colors of the paint chips that I use for this presentation are all Shades of a color (Darkest Value). Any lighter version of that color, on the same paint chip (tint) would work just fine. A tint is a shade mixed with white to make it lighter. So now go and look through interior decorating magazines. Pick out the three or four main colors that they used to make up that room. Also, look for rooms that have three colors, and the fourth color is the color of wood, be it on furniture, woodwork, etc. Happy examining and analyzing! It’s Easy to Paint Horizontal Stripes on a Wall, Step by Step Instructions 11-8-2013. Looking at the Different Shapes of Lamp Bases 12-20-2013. This entry was posted in Interior Decorating Principles, Picking Paint Colors Interior / Exterior / Front Door / Roof, San Francisco Chronicle / eHow references or resources. Bookmark the permalink. 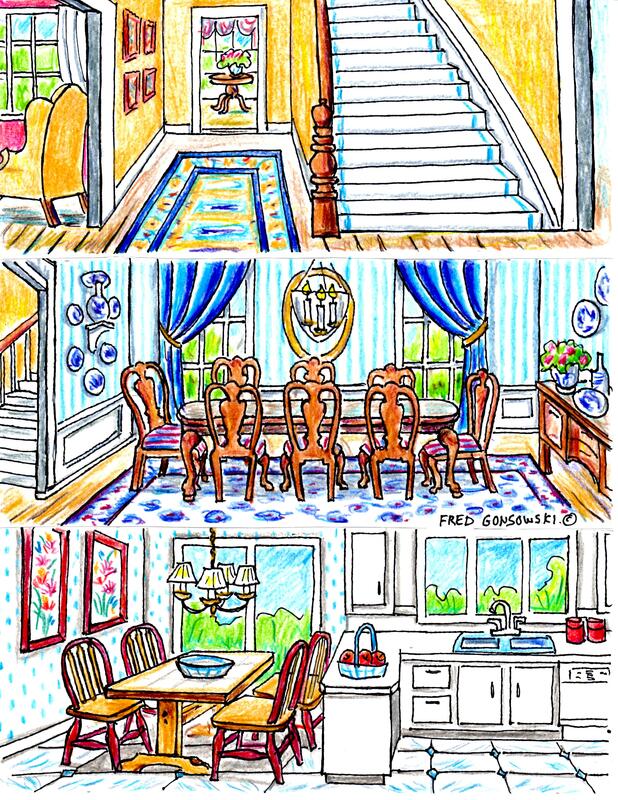 16 Responses to Pick (Use) four colors when decorating a room. If you want to see all the decorating topics I have covered, look at the Categories spot on the right side of the screen and click on Interior Decorating Principles. At the end of the first page click on Older Posts and you will see more topics on design I have covered. I am going to write many more in the coming weeks and month, I just got sidetracked with a lot of gardening topics. As for writing a book, I would love to, but you have to have a publishing house that wants to print it, and getting one to do it is not that easy, unless you are famous. Maybe some day someone from the book or magazine world will see this blog, like my writing style, and have me do something for them. Until that time comes, I’m doing it for the world to read right here, and I’ve helped already hundreds of thousands of people with many parts of design and gardening issues. THANK YOU!!! Not sure why it’s so difficult to decide whether “wood” is a color or not, but I have asked that question repeatedly and couldn’t seem to find a good answer. Great to know! You specify that white is a “free” color. What about black? Hi there Erin, Black is not a free color, You will have to count it as one of the four. But, if you work it across the space in small amounts( think accent color), not isolating it in any one spot in the room, I say use it if you love it. I am not here to tell anyone NO, but want to get people thinking about things, and give them rules that help to empower the readers so they can understand what they are looking at when going through magazines, show houses, or watching decorating shows on TV, and decorating their own homes. Thank you for all these design tips! I’ve always been an artist but for some reason color in decor is a concept that overwhelms me… I want to throw in every color of the rainbow it seems. Thanks for making it easier to understand and simplify! Hi there Anna, I have three other blog article that you might find interesting; they are titled Color Theory… When Interior Decorating a room remember Wood is a color too ,… When Decorating a Beige Room, think Tones, Texture and Sculptural Interest, and Looking at the different Patterns used in Interior Decorating used on Fabric, Drapes, Wallpaper and Carpeting. I have a Bachelors Degree in Fine Art, and all the topics I cover are based on color theory, design and other things I studied in art school. My next post is about using Gray when interior decorating your house. Thanks for your comment. Hi there Elina, not seeing your space, or furniture, I would say take newspapers and tape them together to make a 15x16foot template that would represent the rug you are thinking of making and lay it on the floor in your loft and place your furniture on it. In one second, you will see how something that size works with your furniture and the shape of the room itself; you might want to add or subtract a few inches/foot or two to the rug’s size at that time. You could also tape off the floor using blue painters tape to see the shape, but with the newspapers covering the floor, you will see what it looks like with a certain amount of your floor being covered. As for color scheme, black would be counted as one of the colors if it is used in large amounts, otherwise think of it as a subordinate color or one extra accent color. When picking out the yarns for the new rug, make sure they match exactly the colors of the yarns for the other two rugs so there will be a continuity of color and all the rugs will share a similar color story. What do you think about the color red-orange(some kind of rust color or salmon)? You could add that to your mix so you will have something that pops. The red-orange would go with the yellow-orange of the floor and the red orange would be the opposite of the indigo/navy that you have. If that color works for you, take the fabrics you have to furniture stores, fabric stores, etc and run them by the red-oranges and see if anything catches your eye. Good Luck with your project. This has been helpful, thank you! When we first bought our house in 2012, my husband talked me into oriental rugs for our bedroom. dining room and living room. The navy rug in the living room has been a thorn in my side because I just couldn’t figure out how to decorate around it. Hearing about the 4 color rule has helped a lot- not to mention, your colors are very similar to ours! I have two gold arm chairs and wooden drum table from my grandmothers, and the living room has a fireplace with brick-red tile around it. We also have a large floral painting that has light blue which works quite well with the smaller, linear designs of the carpet. We’ve been stuck on wall color and curtains for ages- do you have any suggestions? The room gets a lot of light since it is the front of the house and it has a large archway into the dining room (dark wooden table/ chairs, garnet red beneath the chair rail to match the red oriental rug, top portion of the walls are just cream colored). Hi there Laura, look at this post first that I wrote The Color Blue, the Next Decorating Trend, it might help you with colors. Then look at Looking at Patterns us in Interior Decorating on Fabric, Drapes, Wallpaper and Carpeting, followed by Interior Decorating.. Looking at the Different Sizes of Patterns used on Wallpaper and Fabric, and the third article in that series Mixing and Matching Fabric and Wallpaper Patterns. Those 4 posts cover a lot about what might help you. Also read this (it might make you think about your dark bottomed dining room) Paint a Room a Dark Color, then add Light Accents. Picking and Hanging the Right Size Picture or Mirror over your Fireplace and The Right Way to Hang Curtains and Drapes. To read, or at least see every one of the decorating posts that I’ve ever written look on the right of your screen for the word Categories, then scroll down to Interior Decorating Principles there might be many other decorating topics that interest you there. Good luck with your project. Your inquiry will bring about a full post that I will be writing in the near future. Hello Fred. I’m so happy I found your website I been reading a lot of your post. I live in a Barndominium. It’s basically and metal structure with living quarters. We have lived in the house for over a year and my walls are still bare. I’m lost, I don’t know what to do, what colors to choose. I have sectional from Bassett furniture. It’s dark brown with nail head trim. I have Concrete stained floors that are a brown it looks like old leather. My ceilings are 16′ and I have absolutely nothing on my walls. A flat screen tv on top of a brown console. So my predominate color is the dark wood? Correct? I should be clear. I described my living room above. Hi there Melissa, First of all I want you to go out and find a colorful patterned area rug and put if on the floor in-front of, or in-front of and under your Bassett brown sectional. When shopping for the area rug bring a pillow or cushion from the sofa with you. Look for an area rug that has some brown in it that matches, or goes with the color of brown of your sectional. Look for a rug with a good amount of colors in it. Being brown, you will probably find things that also have gold, green, red-orange and cream, or brown, tones of blue, and even gray and some red as part of a color story. Well, whatever you find, and make sure the rug “Smiles at You” use those colors for your subordinate and accent colors. Look for colorful pillows for the sofa that pull the colors from the rug, possibly a throw, ceramic vases, art works that possess the colors of the rug etc. Also don’t be afraid of mixing patterns. Read my post Looking at Patterns used n interior Decorating on Fabric, Drapes, Wallpaper and Carpeting. Also look at my post Hanging Pictures Around a Room, and look at the companion posts on hanging pictures that follow the article. Also look at The Right way to hang Curtains and Drapes, and look at the companion posts that follow that article. Thank soooo you Fred. Again I am so happy I found your website. My husband is a builder and our house is one of the “show” houses. I feel so bad because it’s not decorated but I want to buy pieces that I love and make me happy Have you ever done private consultation? Perhaps I can send you my floors plans and pictures of furniture I have? I’m a visual learner and your hand drawings have help me some much. Email me me if you are interested. Hi there Melissa, I’ve looked over your husband’s building business, and I see that there are many house plans. Is your house one of them (which number)??? ?, if so I could possibly create a blog post based on the floor plan.